I am going to write something that is dumber than my usual. Oregon could have won that game. In a different reality where Herbert was not hurt, Oregon would have been in that game, as the offense would have had more sustained drives and more of the playbook available. Considering some of the superb plays by the defense and some mess-ups (short punts) by our opponent, the Ducks could have been ahead by ten points at half. Then it would have been a much different game. Again – to run a quarterback who is not built to run like a Quentin Flowers or Masoli/Thomas is asking for trouble, which I expressed concern about after the Nebraska game. But Coach Taggart doubled down and got both of his quarterbacks injured in the Cal game by running them on purpose. The heck of it is — Herbert threw for six touchdown passes against Cal the year before. 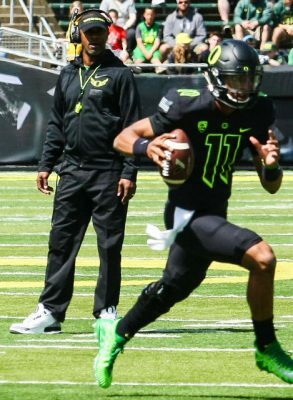 So far this year, Taggart has not utilized the quarterback’s talent to its highest potential. But Charles, it is our identity. Well, you’d better get used to losing football games as part of that identity until Taggart replaces the running quarterbacks who were on the roster last spring. And if you were counting on a win against the Wildcats when Herbert returns , you’d better rethink that back to 50/50. Talk about having running quarterback depth at Arizona! Holy Crap! The football recruiting is mind-boggling, and what Coach Taggart is doing is completely insane at Oregon. (We greybeards can confirm that.) Remember when I wrote that the record for the most four- or five-star recruits coming to Oregon was 12 in one year? With the verbal commitment yesterday, the total on Rivals.com is now 15 (who are of the same criteria) with still more to be announced over the next four months. The Ducks cannot win without superior talent, and Coach Taggart deserves the greatest of credit for his juice and for putting together a staff to assemble a team that can aspire to the biggest of goals. It is an undreamed-of step forward and one that I simply could not have imaged. It is incredible. How many pennies in a million? 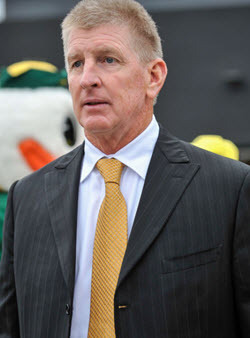 A lot, and Defensive Coordinator Jim Leavitt is worth every one of them. I continue to be amazed at the improvement — the growth right before our eyes. It is great fun – simply astonishing – considering what we greybeards have witnessed at Oregon over the years. Yes, this is a second massive step forward in the performance of techniques in individual plays, and the implementation of the overall defense being played. Can you believe those blitzes? I am still stunned by all the lowerclassmen who played on Saturday as we all watched: Brady Breeze, Thomas Graham, Deommodore Lenior, Sampson Niu, Jordon Scott, Austin Faoliu, La’Mar Winston, Troy Dye, Drayton Carlberg, and Blake Rugraff, along with safeties Nick Pickett and Billy Gibson in recent games. Whew! 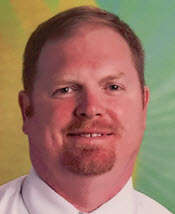 How do you do so well with so many newbies? The answer is amazing coaching by Jim Leavitt and his staff. In Oregon’s 3-4 defense, the Ducks often operate a “Cover-4” defense in the secondary: four defenders responsible for a quarter of the field, vertically going backward. The safeties will usually be playing close to the hash marks in this defense, but Coach Mike Leach designed the Washington State passing routes to pull the Oregon safeties away from the middle of the field. This leaves the shallow crossing routes open, which the Cougars exploited extremely well. The plan demands a salute to Coach Leach – and our consultative coach for pointing that out. Did these Duck defenders really only allow the Cougars to convert on two of twelve on third down? And against Luke Falk and the offense that just beat USC? Bottom line: Defense has improved so much yet has an enormous upside over the next two years. It is very, very exciting to ponder. Again, it is another massive step forward. The Oregon offense is a step backward, and not just because of a shortened playbook for a rookie quarterback. You have to remember that this website has published over 280 analysis articles and videos, which have been viewed over a million times. No other media source for Oregon football has the depth of knowledge and analysis that we have here. In the video above, Oregon is running a Counter Trey with what McGuire calls a “Sniffer” (what we refer to as an “H-back”), who is one of the lead pulling blockers on the play. The problem is that some basics are being missed at times, and the example here is the center who is blocking backside and has an easy angle on the defender on the play. Note how the WSU defender got free and was in on the tackle: The center did not to carry out one of the fundamental components of run-blocking that is taught to freshmen in high school – the placement of the blocker’s head. Remember when the Grizzled Ol’ Coach (who is now on sabbatical) taught us that, as the blocker, you put your head between the defender and the ball? That is what McGuire is referring to, and he felt it was a reason for the paltry running attack against the Cougars. In short, the coach and I were quite disappointed with the offensive line. The Zone Blocking was not going well for Oregon, and Cougar linebackers were free all day to make tackles. This put more pressure on the passing attack as well as a freshman quarterback who had nobody with experience catching the football. We saw many passes that should have been caught shoot through the newbies’ hands. The dilemma at receiver is not Taggart’s fault. Come next fall, this group will be dependable as a result of all this game speed experience. 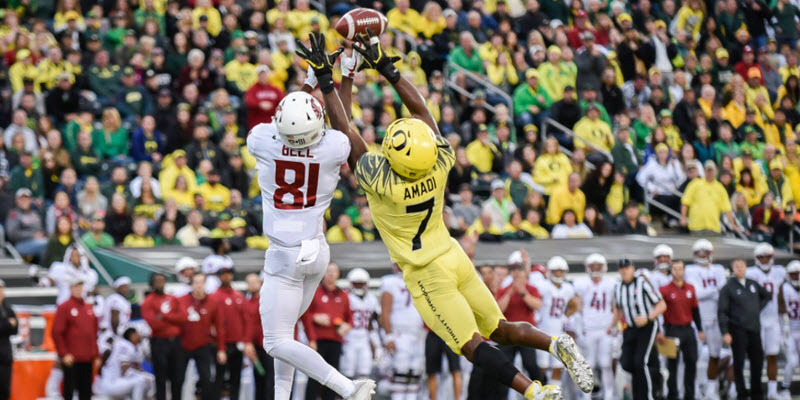 In the meantime, this new offense is not ideally suited for the personnel we currently have, and all of us will have to be more patient while Taggart carries out his vision of what we all believe can happen for the University of Oregon. P.S. You like this type of commentary? Pass it on!